I admit it. "Sorry" does not easily from me. I grew up where sorry is not usually spoken of and forgiveness only comes with time. But it is never that I am okay with not being told I'm sorry, I appreciate it. You just can't really expect much of that word from me, aside from the habitual response when I accidentally step into the shoe (or toes) of a fellow passenger in a cramped jeepney or when I bump into someone 'cause my mind was far off wandering somewhere. Saying “Sorry” has always been in our roots since childhood. Every after our jabbing session with my brother, our mom would always let us hug and say sorry with each other. And you know what, after that we are again close as glue. The thing that hindered me from saying sorry, aside from the fact that it is not the word I grew up with, is my silly pride. Most of the time, I believe I am right or I am victim, whichever is applicable. 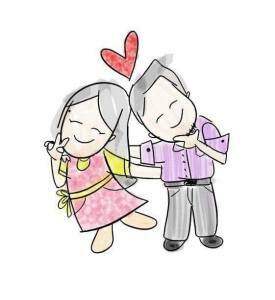 Saying sorry even when things are not settled yet, or it has not been resolved yet what the crime is or who the suspect is, is something I learned from my husband. I'm getting the hang of it. Congratulations, self. I don’t know if you find that unusual, but as I said before, I’m not your typically guy. Whether it is my fault or not, I start a conversation by saying “I’m sorry”. Though here comes the tricky part: after saying I’m sorry, my wife usually would then deal with the details to why I am sorry, what I have done wrong, and/or when do I think I have disappointed her. That is why it is very important to know how to dialogue the right way. Related Content: How to dialogue the right way. Saying or hearing sorry calms the heart. For me, it is like a signal that the other one is eager to talk and settle things out. It is a signal that he or she is sincere. I particularly appreciate my husband when he says sorry for some things even if I know it's my fault. It makes me guilty. And in a positive way, it makes me say "I'm sorry" too. And if I was crying the moment he says sorry or if I was done with my crying episode, expect me to burst once again, this time, with my heart calm and open. That is one secret I should give you guys: say sorry first regardless whose fault it is. It calms the heart, and your partner is now open to hear your part. 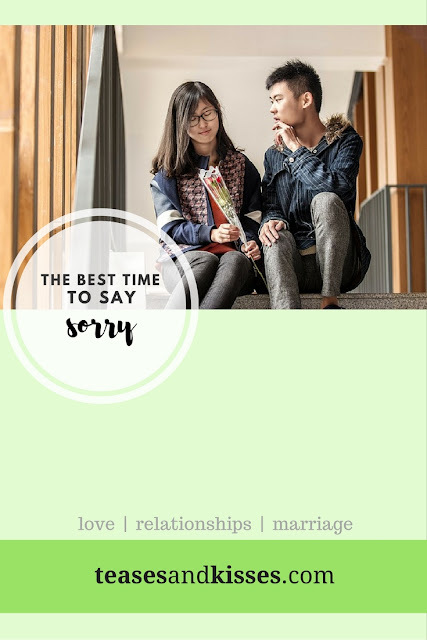 Though this is kind of tricky based on my experience, there will be times when you say sorry and your partner may not be willing to accept it. Don’t force it, it may end up you being angry and the result will not be good. Just ask her “Do you want to talk about it?” If she’d say no, then let her cool down first. Then come back, open it up again, and never let the day end without settling things down. Saying "sorry" is one of the things couples should habitually say to each other, aside from "I love you" and "Thank you".Saying sorry does not mean you are wrong. It simply opens you both to a dialogue so you can begin processing the issue. It opens up your feelings. It calms the sad or anger of the other person. If your partner isn't likely himself or herself, do not hesitate to ask what's wrong. It may be something you said or did, or something you didn't. Did you do something today that you think you should be sorry for? Don't think twice, say sorry. And mean it. TnK tip: peace offerings such as chocolates and flowers can also speed up the process.